Sorry, sign-ups were too low, check back in 2012! OrganicAthlete Victoria is pleased to be organizing the first big racing event since the re-opening of the Victoria Commonwealth Legacy Velodrome in June of this year! There will be three nights of racing, beginning at 6:30pm each night, featuring Madison races. 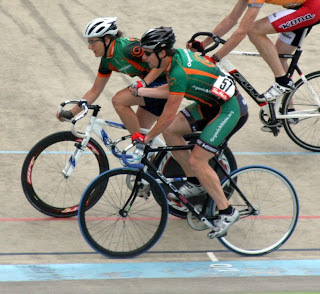 If you're unfamiliar, Madisons are unique to track (velodrome) racing, with teams of two competing in 'bunch' races. One rider 'rests' up high by the railing, while the other races. They exchange positions with a high-speed hand sling (see photos!) Madisons are among the fastest cycling events, and speeds are expected to average 45-50kph in most events! We would love to welcome 12+ teams for two categories, but chances are we'll be mixing in A & B teams. The A racers will be gear-restricted to 84", and the B's will be limited to 86". Each night we have four Madison races - three bunch races, and one TT. Bunch races will start with a Neutralized Scratch each night (to give all a warm-up), and events will include Scratch, Snowball, Win'n'Out and Points races. TT (time trial) events will be the 4km Pursuit, the Kilo and the challenging Madison Flying 200m TT. We will post a schedule soon. Cost: $15 per night per team, $40 for all-three. We hope to award four Championship jerseys to the best teams in each category: Overall, TT, Mass Start & Women's. (There must be at least two Women's teams for us to award this.) The draft design can be viewed here. Online pre-registration is here (no $$ necessary, please pay at the event). If you do not have a teammate, please sign up, and we should be able to pair you up with another! In the mean time, book off these dates in your calendar, and email victoria@organicathlete.org if you have any questions. Thank you to our 2011 sponsors: Green Cuisine, Purica, Vega, Oak Bay Bikes, Eatmore Sprouts, the Victoria Soap Exchange, Tattoo Zoo, Crag X Climbing Gym, Vancouver Island Paragliding and new team sponsor Ridley Bicycles!